Welcome to this week’s challenge with the Paper Craft Crew Design Team! It’s the start of a new year, and if you’re like me, you’ve pretty much depleted your stock of Birthday cards. And since I have 3 family birthdays in January/February, I need more, fast! So this is a very timely challenge – the theme is Birthday Celebrations! You can use any stamp set and colour combination that you want – your card just has to be a related to celebrating birthdays! I just borrowed the Carousel Birthday set from one of my team members (thank you, Lynn! ), so of course I had to use it for this challenge! I can’t wait to make more projects with this set, as I think it’s so cute, and it has terrific elements to use; along with the cupcake ferris wheel, there is a gorgeous carousel horse, and 3 tents of the Big Top! 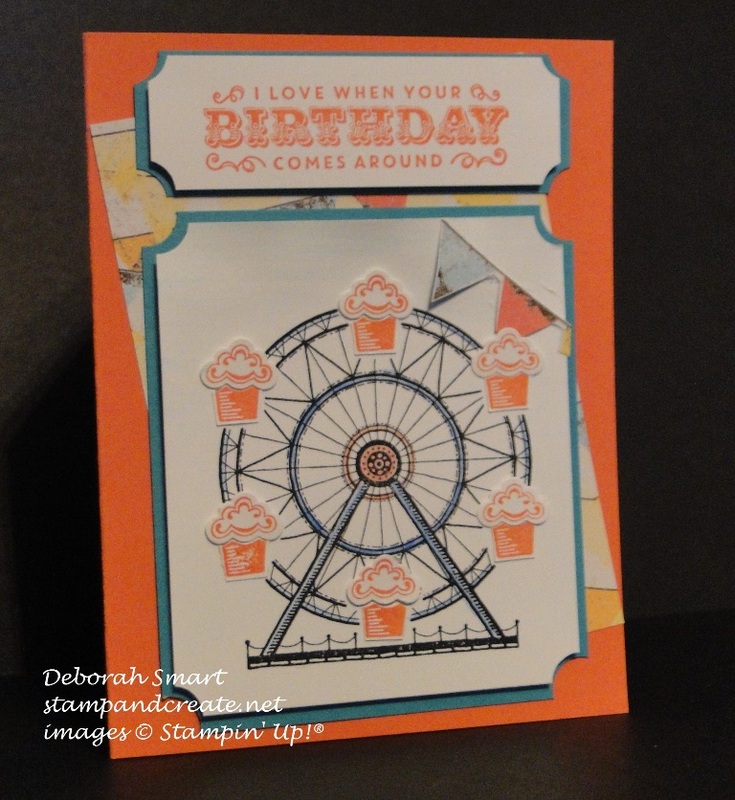 I decided to start by using the ferris wheel image; I stamped it in Archival Black ink onto Whisper White cardstock. I then stamped it again on another piece, this time in Calypso Coral ink, and used my Up & Away Thinlits Dies, which coordinate perfectly for die cutting the cupcake tops! It also works to die cut the bottom of the cupcakes, but it does leave a bit more white around the piece than I liked, so I just snipped away the extra white surrounding the cupcake bottoms. 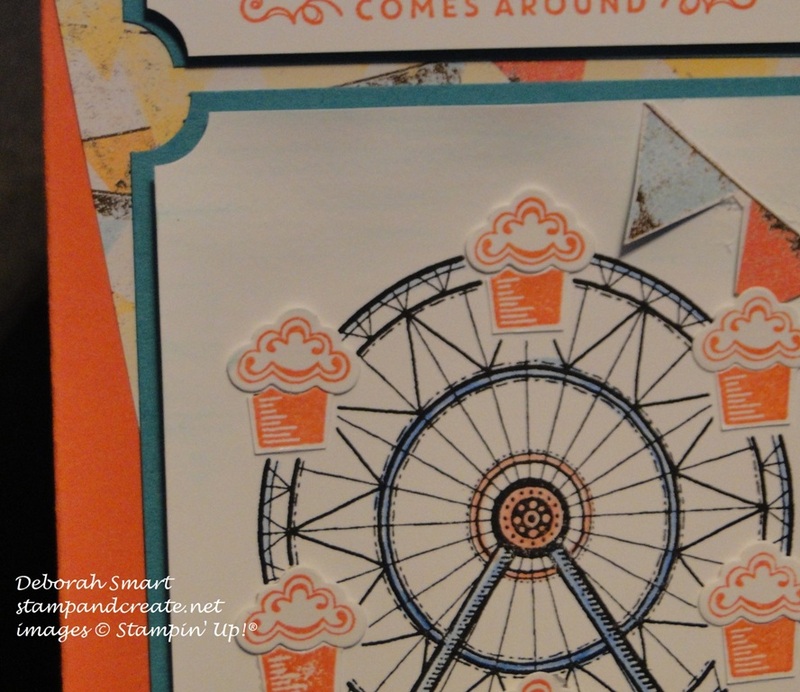 I used my Watercolour Pencils to colour in the ferris wheel; Calypso Coral pencil for the inside, and Bermuda Bay for the main supports and outside ring. I didn’t use anything to blend them with; I just used them as colouring pencils! I then attached the cupcake bottoms using the Multipurpose Liquid Glue, and attached the cupcake tops using the Glue Dots. I cut panels of Bermuda Bay cardstock and the Cupcakes & Carousels Designer Series Paper Stack, and layered them onto the Calypso Coral cardstock base. 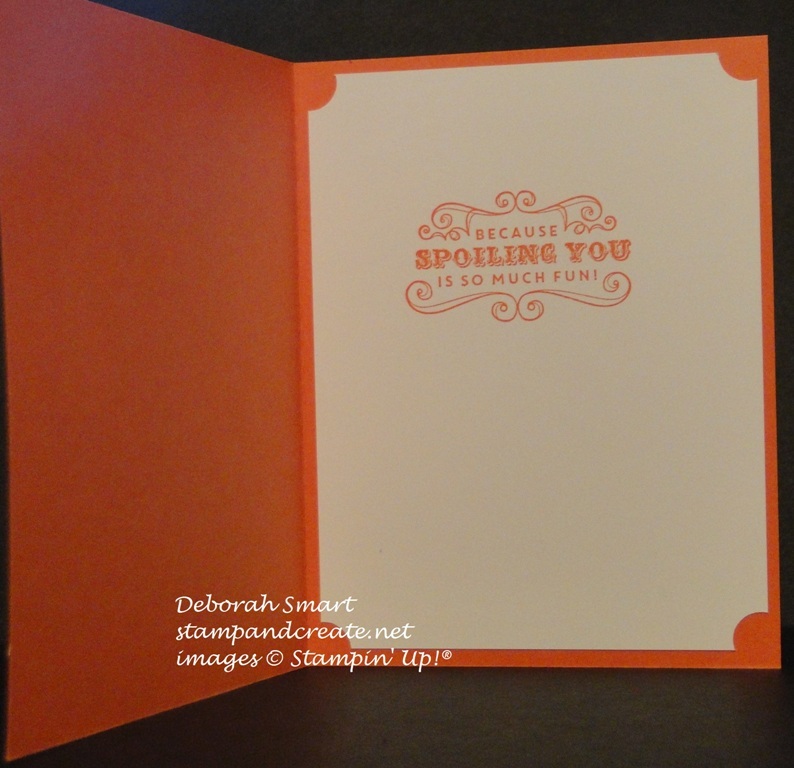 I angled the DSP, and used my 1/2″ Circle Punch to punch off the corners of the stamped image panel, and the Bermuda Bay panel; it reminds me of how a carnival ticket looks. I did the same with the panels for the sentiment, which I stamped in Calypso Coral ink. I hand cut a bit of the same banner pattern that I used as a panel on the card, and added the flags in the corner of the stamped image, just for a little extra detail, as you can see in the photo above. Aren’t those die cut cupcakes just adorable?! I hope you enjoyed my card – let me know what you think! Just leave a comment for me; I always love to read what you have to say. Next, you’ll want to head over to the Paper Craft Crew blog page, to see the rest of the Design Team’s creations – you’ll find tons of inspiration there! Then, be sure to link up your own card for the challenge – you just may be our next Top Pick! If you’d like to order the products used to make this card, you can either order from your own demonstrator, or click on the images below and order from my online store. Previous Previous post: Sale-A-Bration Kick Off Fun! Deb, this is such a lovely card! I too have been on the fence about this suite of products. Frustrating when friends make resistance a challenge! Thanks for such a nice comment, Jackie! I think you’d really enjoy this set; I’ve only just started using it, and I see lots of possibilities!